I made this last summer. Apart from looking sensational, it is very refreshing on a hot summer’s day. The best is to start with the Kiwi, which is the smallest of the three ingredients. Peel the fruit and start by calculating the size of your cubes from this fruit first. 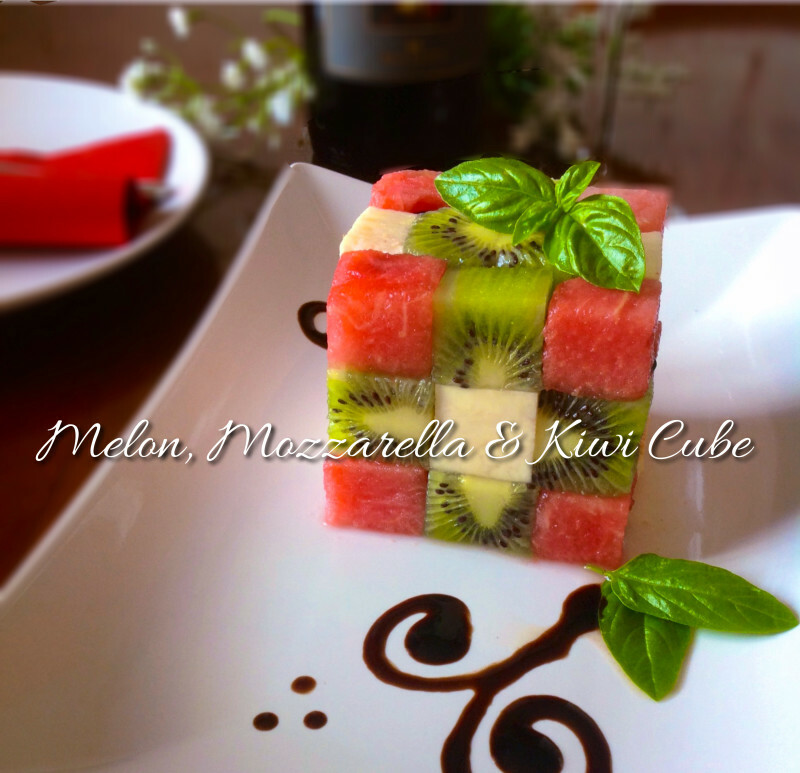 Next you have to cut the mozzarella, first into lengths the same size of the cubes and then into cubes, using your first kiwi cubes as a guide. Do the same with the water melon. To assemble, take a white serving plate, and put four melon cubes as corners, kiwi cubes in between on opposite sides and mozzarella cubes on opposite sides in between. In the middle you can put any cubes that might not have come as nice as the other cubes when cutting them. For the second layer, you put the kiwi cubes at the four corners and in between you use the mozzarella cube on opposite sides and melon cubes in between on the other opposite sides. Again, in the middle, use cubes that were not so perfect whilst cutting, always leaving the best ones for the facades. For the last and topmost layer, you have to repeat the same pattern as with the first layer, i.e. 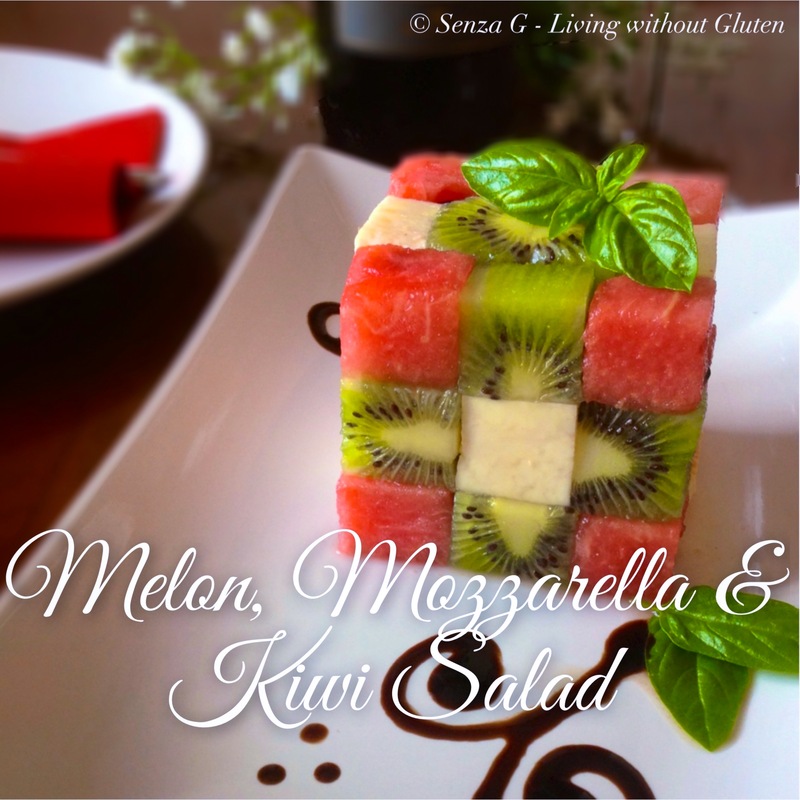 put the melon cubes at the corners and the mozzarella and kiwi in between them on the two opposite sides. I put a kiwi again in the middle. Serve garnished with basil or mint leaves. A lovely squiggle with balsamic glaze finishes it off! Note : You can also use the packaged feta cheese which is firmer than the mozzarella and easier to make sharp cuts.